Yellowstone National Park is far more than its famous geyser, Old Faithful. Half of the world’s geothermal features are in Yellowstone and the park has the largest concentration of wildlife in the “Lower 48” including black bears, wolves, wild horses, lynx, pronghorn antelope, moose, bison, badgers, otters, fox, trumpeter swans, pelicans, eagles, and close to 500 grizzlies. It is home to one of the largest herds of elk in the United States and one of the most remarkable fossil forests in the world. Yellowstone Lake, one of the largest high-altitude lakes in North America, is centered over the Yellowstone Caldera, the largest super-volcano on the continent. Established in 1872, this is America’s first national park. From the geothermal wonders of Yellowstone we take you to the cool, reflective waters and pristine wilderness of Jackson Lake and the Snake River in Grand Teton National Park. Experience the scenery, wildlife and natural history of two of the West’s most popular national parks and a multitude of adventure vacation activities from whitewater rafting and hiking to learning about geology, local history and more. The pre-trip meeting begins at 7:30 pm at the Lexington of Jackson Hole. This is an opportunity to greet your fellow travelers and guides, and ask any last-minute questions. Your guides will give you a thorough trip orientation, and pass out your waterproof bag so you can re-pack your belongings that evening. After an early departure from Jackson, we begin the first day of our adventure in Yellowstone National Park with a visit to Old Faithful, the world’s most renowned geyser. We’ll view its regularly occurring eruption and then meander along the extensive boardwalks that highlight the otherworldly geothermal features in the area, often sharing the experience with a stray bison from a nearby herd. Following a delicious lunch, we’ll check into our accommodations for the evening in beautiful West Yellowstone. We may plan for an afternoon jaunt into the Lower Geyser Basin, viewing more fascinating geothermal activity before returning to the lodge for a delicious welcome dinner. After breakfast we make our way further into the heart of Yellowstone National Park, passing the Fountain Paint Pots and thundering Gibbon Falls. Near lunch time we’ll arrive at the Grand Canyon of the Yellowstone River, taking in the awesome power of the Upper and Lower Falls. Artist Point is must-see view—be sure to keep your camera or sketchpad handy! From the Canyon we’ll drive south to Yellowstone Lake, the largest high alpine lake in North America. Our destination is Flagg Ranch, were we’ll check into our accommodation for the night. The late afternoon is free for you to explore the grounds, reconvening for dinner as the sun sets behind the mountains. After enjoying breakfast, we’ll make our way to Jackson Lake. We’ll launch our kayaks from the Signal Mountain Boat Ramp and head out across the lake toward our camp on Grassy Island, located in Moran Bay. We’ll stop for a picnic lunch en-route, excited to arrive at our secluded island camp, which will be our home for the next two nights. We will keep our eyes open for moose, elk, fox, beaver, black bear, mule deer and coyote that are found in the area. After a leisurely morning and breakfast in camp, we’ll hop in the kayaks and paddle over to Bearpaw Bay, where we’ll have an opportunity to head out on an extended hike to emerald lakes. We’ll have lunch on the lake shoreline, perhaps wading into the crystalline waters to cool off. In the afternoon, we’ll return to Grassy Island for another night of fantastic wilderness cuisine and camping beneath the starry sky. Now that we have conditioned sea legs we depart our Grassy Island camp and paddle to Spalding Bay. En route, we will stop for lunch along the southern shore of Jackson Lake and take in the majestic view of the Tetons. Spalding Bay camp is spectacular, and will be our destination for a delicious dinner and a night under the stars. After breakfast we depart Spalding Bay for Signal Mountain Boat Ramp, where we leave the sea kayaks behind and transfer by van to the Snake River near Pacific Creek. Our rafts are waiting for the 10.5-mile peaceful meander along the base of the Grand Tetons on the Snake River. Look for wild trout as we float along, but fishing is not allowed. We may see moose browsing on willow, or yellow-bellied marmot sunning on the rocks. Take-out is near Deadman’s Bar, with a late afternoon return to Jackson. Single Supplement: If you are traveling solo and are willing to share a tent and lodge room with a fellow traveler, we can do our best to match you with someone. If we are not able to match you, or if you’d prefer to have a room and tent to yourself, a single supplement is an additional $275. ☐ Reserve flights, shuttles and lodging: Reserve flights, shuttles and lodging: Verify with your adventure consultant that your trip has met minimum numbers prior to booking flights and/or reserving overnight lodging for the night before and after your trip, if applicable. The day before your trip we will meet at 7:30 PM in the lobby of the Lexington Hotel at Jackson Hole (285 N Cache Street, 307-733-2648) in Jackson, Wyoming for a pre-trip meeting. Your trip leader will provide a thorough trip orientation and pass out your waterproof bags so that you can pack your belongings that evening. The trip leader will also reconfirm the meeting time for the following morning and give you an opportunity to ask any last-minute questions. Five major highways lead into the Jackson Hole area: US 26, 89, 189, 191 and 287. If you are arriving by car, parking in Jackson is extremely hard to come by. Street and lot parking are limited to 72 hours. Please check with your hotel to see if extended parking is available. The airport also offers long term parking for $10 per night, but space there is limited. 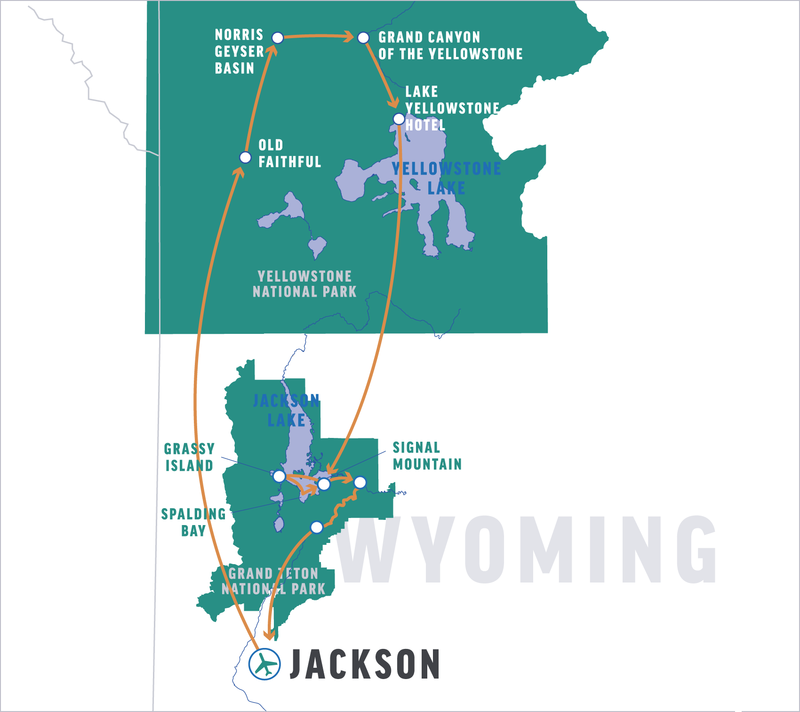 The closest airport is the Jackson Hole Airport (JAC). American, Delta, United and Frontier airlines all service Jackson. There are many taxi companies, shuttle services and rental car agencies available on site at the airport. A complete list can be found on the Jackson Hole Airport’s website: www.jacksonholeairport.com. Alltrans (800) 443-6133 / www.jacksonholealltrans.com will meet incoming flights and provide round-trip and one-way shuttle service to area properties. Advance reservations are required. The Lexington at Jackson Hole, the location of the pre-trip meeting, offers complimentary van transportation exclusively for its guests to/from the airport. Call the Lexington at Jackson Hole at 307-733-2648 upon arrival at the airport for van pick-up (if you are staying at the Inn). The Rustic Inn and Spa also offers complimentary shuttle service for its guests. Please call 307-733-2357 upon arrival. Jackson also has a public shuttle bus that transports people around the town of Jackson for free within Jackson town limits and, for a small fare, to limited outside of town locations. Mountain States Express (Alltrans) (800) 652-9510 / http://www.jacksonholealltrans.com provides a daily shuttle service to Jackson from Salt Lake City. Salt Lake Express (800) 356-9796 / www.saltlakeexpress.com/ also offers daily shuttle options between Jackson and multiple gateway cities. Please visit their website for details. After your trip, you will be dropped off at the Lexington at Jackson Hole between 4:00–6:00 PM. If it’s not essential that you leave immediately, we recommend you overnight and enjoy a hot shower followed by a good night’s rest or a night on the town. Please mention you are an OARS guest for 10% discount. The first two nights will be spent at various lodges within Yellowstone National Park, West Yellowstone or Flagg Ranch. The final two nights of the trip will be spent camping on Grassy Island, or along the shore of Jackson Lake at Coulter Camp or Spalding Bay in Grand Tetons National Park. Sea Kayak—The ultimate flat water explorer—at home in open seas or inches from shore. Stealthy, quiet and quick, sea kayaks are the premier platform for wildlife viewing. From alpine lakes in Wyoming to island hopping in Baja or the Galapagos, sea kayaks are a low-impact way to get out on the water. Generally two-person kayaks are provided; single kayaks may be available upon request. Children as young as 7 may accompany the trip. Due to kayak design and the pace of our trips we must restrict requests for single kayaks to those with a height of 4’11” or taller, and 14 years or older. Previous paddling experience is also suggested. Children younger than 14 must ride in a double kayak with an accompanying adult. We’re very sorry that we’re unable to accommodate children younger than 14 if there isn’t an adult in your party to paddle with them. Please Note: A motorized raft is used as a support boat on the lake. After an active day of paddling or hiking and exploring, we prepare to camp for the night. Upon arrival, our first task is to unload the vans or the boat (depending on where we are camping) using a bagline of crew and passengers to expedite the process. Individuals then collect their waterproof bags and locate an area on the beach to camp for the night. On the first night in camp, a crew member will give a demonstration on setting up a tent, which you’ll see is quick and easy. The guides will set up the kitchen and central dining/seating area with camp chairs. They will also locate a secluded area away from camp to set up the portable toilet, where privacy is assured. In the morning, the first wake-up call will let you know that coffee, hot water for tea or cocoa, juice, fresh fruit and cold cereal are ready on the hors d’oeuvres table. You can fill your mug and grab a bite, then begin to pack up your personal belongings and sleep gear as the guides prepare breakfast. After breakfast is served, the entire camp will be broken down and packing will be completed. The gear will then be loaded onto the boat and we’ll head out to see what new adventures await us. We need to know as soon as possible about any dietary restrictions we should consider in planning your trip. If you have food allergies or restrictions, we will do our best to accommodate your needs. However, there may be a supplemental menu fee, ranging from $5-25 per person per day, to cover any increase in our costs. We provide two sodas per person per day, water and lemonade in cans. Commercial outfitters in Yellowstone and Grand Teton National Parks may not provide any type of alcohol for their guests. You are welcome to bring your own favorite beverages, alcoholic or non-alcoholic, in non-glass containers. If you choose to bring additional drinks or alcoholic beverages, please let us know in advance. For your safety and the safety of others, the consumption of alcoholic beverages is limited to camp. We carry sufficient drinking water along with us to provide for your needs throughout the trip. Water jugs are accessible in camp, at lunch time and before hikes for filling personal water bottles. Each day varies, and on the days we paddle Jackson Lake you’ll spend 2-4 hours a day in the boats. Other activities can include hiking and exploring, swimming, beach activities or enjoying the tasty meals while just relaxing in camp. While we generally plan at least one guided hike on each trip, we also try to provide ample opportunity for the curious to explore the area at length, but because these trips are in bear country, we limit the amount of exploration clients can do on their own. Please let your trip leader know if you are an avid hiker, and plan to bring extra water bottles and good shoes. Fish in Grand Teton National Park are plentiful and include brown, cutthroat, Mackinaw and rainbow trout. A Wyoming fishing license is required to cast your line in the abundant streams, creeks, rivers and lakes however fishing is limited to camp (by the terms of our permit). You can purchase a non-resident Wyoming fishing license in Jackson or at the Signal Mountain Lodge store for approximately $14 per day. Children under 14 years of age and accompanied by a person possessing a valid Wyoming license may fish free (and their fish are included in the accompanying adult’s creel limit). You’ll need to provide your own fishing gear. For local fishing information call Orvis Jackson Hole (307-733-5407), Jack Dennis’ Outdoor Shop (307-733-3270) or Snake River Anglers at Dornan’s (307-733-3699). Urination is done away from water sources on rocky or sandy areas, or on pine duff. We encourage you to carry water with you to dilute your urine to avoid concentrating urine odors, which can attract animals. Bathing is not allowed in the lake or in any of the side streams. You may want to bring a solar shower or you can borrow a bailing bucket from one of the rafts to rinse off after soaping up. Both are to be used at least 200 feet away from the water source in an area that will absorb the runoff. We recommend using a liquid biodegradable soap such as Campsuds or Dr. Bronner’s www.drbronner.com which can be purchased in most stores that have a camping section and can also be used to wash clothes. You may also find a good selection at your local health food store. Disposable anti-bacterial towelettes (Coleman Swash Cloths, baby wipes, etc.) are especially convenient. Once you are on the river there is limited communication with the “outside world.” Cell phone service is not always available. Our guides carry satellite phones which are strictly used to call out in case of an emergency situation on the river. They can call out, but we cannot call them. Periodically the trip leader will check in with our office. If you have someone that needs to contact you about an emergency at home, they should call our office (800-346-6277). If possible, we will relay the message to you. For your family at home you should define for them what you consider an emergency and provide them with instructions to call our office in the event one occurs during your vacation. Your trip will visit areas ranging from 6000 – 8400 feet above sea level, therefore you may experience symptoms associated with altitude illness. We recommend the following measures to help prevent altitude illness: arrive ahead of your scheduled departure to allow for acclimatization; drink 3-4 quarts of water every day; make sure about 70% of your calories come from carbs; only use alcohol, tobacco or sleeping aid medications in moderation or not all. Please familiarize yourself with symptoms, treatment and more about altitude illness at the CDC. You may want to check one week prior to your trip for an up-to-date weather forecast. We recommend the following website: www.wunderground.com for weather in Grand Teton National Park, WY. The elevation at Jackson, Wyoming is 6,237 feet (1,901 m) above sea level. The following are the physical and mental eligibility criteria for all participants on any OARS flatwater kayaking trip. Ability to remain balanced while seated inside the cockpit of a touring kayak. Wear a Type III Coast Guard-approved personal flotation device (maximum chest size of 56 inches). Wearing leg straps may be required to ensure proper fit. Ability to independently board and disembark a touring kayak four to ten times each day. This may require stepping into the boat, sitting down on the low seat, and then maneuvering your legs into a comfortable position. Ability to independently swim 100 yards in flat water while wearing a PFD. This includes being an active participant in your own rescue, including having the ability to (a) keep your airway passages sealed while underwater, and regain control of your breathing when being submitted to repeated submersion under waves or currents; (b) orient yourself to new “in-river” surroundings; (c) reposition yourself in the water to different swimming positions; (d) swim aggressively to a boat or to shore; (e) receive a rescue rope, paddle, or human assistance, and possibly let go of the same; (f) get out from under an overturned boat. Our primary goal is to minimize the risks associated with adventure trips in a wilderness environment. The trip involves physical exertion and exposure to the elements, including cold water and the potential for heat, sun, wind, rain and snow. We have experience accommodating people with a wide range of physical disabilities and/or health conditions. However, individuals who are overweight, lack conditioning, or have other physical limitations or ailments that interfere with the realistic encounters on the wilderness can endanger themselves, other guests, and the guides. Please consult your doctor if you have medical or health conditions that could impact your ability to participate in this outdoor adventure. Wilderness kayaking trips are inherently risky. While the risk of a trip is part of what makes it an exciting adventure, you must be entirely respectful of the risk that such a trip poses. It is important that you are confident in your swimming ability, and your ability to stay calm in the event you become a non-voluntary swimmer. In camp—When the weather is warm, lightweight cotton pants/skirt or shorts and shirt make great campwear. Anytime the forecast calls for cool evenings and cold nights, a dry set of long underwear is the perfect base layer under long pants and a fleece sweater. In camp—We recommend wearing shoes in camp due to risk of kicking a rock buried in the sand, or stepping on a sharp stick. The athletic shoes or light hikers you bring for hiking can double as your camp shoes. It’s nice to put on dry socks and shoes after a day on the water. Flip flops or slip-on sandals are OK for wearing in camp only. During the day—Wide-brimmed hats are a good choice for sun protection. During summer months, conditions may be hot and sunny. These trips require less gear than spring or fall trips, but thoughtful packing is still required. Protection from the sun and heat will be critical to your enjoyment and health while on the river and during side hikes. To protect yourself from the sun’s rays, consider bringing long-sleeved shirts and pants. Synthetic or merino wool long underwear is a must-have on kayak trips. It can be worn under shorts, rain gear, T-shirts, etc., then stripped off when the chill of the morning has worn off. It keeps you warm even if it’s wet (which can happen easily), dries quickly, and it’s compact enough to be stuffed into your small waterproof bag or daypack after you take it off. It can be layered under your waterproof rain jacket and pants. In cooler weather a rain jacket and pants work better than a wetsuit, because the jacket and pants can be put on when it’s cold, then easily taken off when the sun comes out and it’s warmer. Be aware that cotton items, once wet, do not insulate; only synthetic and wool materials will keep you warm during cool, wet weather. Something warm for your top & bottom: Bring a good fleece or wool top and bottom, along with a warm hat and gloves. You’ll want to double up on your synthetic layers so that you’ll have a set to wear in the kayaks and a set of warm, dry clothes for camp. Rain gear protects you from rain, wind and the splash while paddling. It is one of the essential items that all passengers should have no matter what time of year you are traveling. Look for jacket and pants that are 100% waterproof, not just water resistant. A hooded jacket is recommended as well as good secure closures around your head, neck, wrists and ankles. Do not bring a rain poncho as it cannot be worn under your PFD. Bugs and mosquitoes can be very heavy at certain times of the year in Yellowstone and Grand Teton National Park. Please come prepared with insect repellent. Long sleeved shirts and pants may also be desirable. You can either bring your own sleeping bag, pad and ground tarp, or you can rent our sleep kit. If you are purchasing your own bag for the trip, keep in mind that a synthetic-fill bag rated to 20°F (the normal range for an all-around, “three-season” bag) is recommended. At the pre-trip meeting each person will be given one large waterproof bag (approximate sealed size: 13” diameter x 25” tall; 3318 cu in; 54.4 L), for your clothing and personal items. A second bag for your sleeping gear (sleeping bag, sleeping pad, ground tarp, sheet and pillow) will be packed and waiting for you when we arrive at the lake. Tents are stowed separately. We also provide a small waterproof bag per person for day use, where you can keep items such as raingear, camera, sunscreen, lip balm, etc. (approximate sealed size: 17” tall x 9” diameter; 1081 cu in; 17.7 L). The bags are cylindrical in shape and pack from the top. Please pack light, and keep in mind that river attire is casual: comfort, convenience and boat space take precedence over style. At the end of the trip, you will return to The Lexington at Jackson Hole with your waterproof bags, where you will be able to unpack your gear before your trip home. In reviewing your statement, you’ll note a $1/person/day donation to Waterkeeper Alliance, a non-profit conservation organization dedicated to preserving and protecting fishable, swimmable and drinkable waterways worldwide. One-hundred percent of these funds go directly to worldwide watershed protection and your contribution is tax-deductible. Please notify our office if you would prefer to delete the donation from your balance. Under most circumstances, if you are of an adventurous spirit and in reasonably good health, you should have no problem enjoying an O.A.R.S. West, Inc. People with medical conditions, including pregnancy, should have a physician’s approval before taking an adventure travel trip. Everyone is required to sign a standard liability release form before the trip, acknowledging awareness that there are inherent risks associated with the Due to the nature of the activities, a condition of your participation is that you will sign this form and return it to our office before the trip begins. Anyone who refuses to sign the form will not be allowed to participate, and consistent with O.A.R.S. West, Inc. cancellation policy, there will be no refund of the trip fees at that time.